Nothing compares to the passion of an air-cooled Porsche owner! With increasing air-cooled values, our mission is give you first class service to protect the value of your investment. 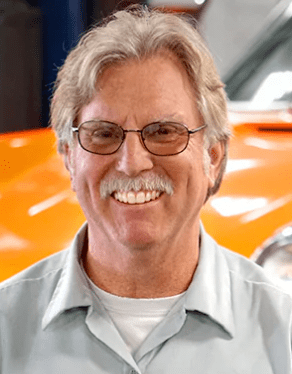 At Rusnak/Pasadena Porsche, your vehicle will be serviced by our factory trained Classic Specialist, Bill Manuel, who has over 40 years of experience and is fully certified by Porsche Cars North America. Bill’s passion and expertise for “Porsche Classic” vehicles extends beyond his role at Rusnak/Pasadena Porsche. Bill displays his long hood Champagne Yellow 911 T at numerous Porsche events throughout the southland. This particular 1970 911 T is quickly reaching 900,000 road miles.When you bring in your air-cooled Porsche for service, your experience will include communicating directly with Bill throughout the repair process. Our highly trained and experienced parts specialists will order, locate and track even the most hard to find parts. “Rusnak Classic” clients will receive special pricing that’s competitive to independent specialty shops, providing a far superior overall value that also includes an exterior wash and interior vacuum prior to pick up. If you own a Classic Porsche, come visit us at Rusnak/Pasadena Porsche. We are located in old town Pasadena but service all of Southern California including the surrounding areas of Glendale, Burbank, Arcadia and Los Angeles. Rusnak Porsche Pasadena is a full-service, Air Cooled Porsche repair and restoration shop. From basic maintenance, repairs, and service to complete restorations and race car preparation, Bill Manuel has the knowledge and the tools to provide premium-level, personalized service for you and your Porsche. Bill Manuel has over 40 years of experience tuning and repairing aircooled Porsche vehicles. He started his career at 15 years of age with the legendary Vasek Polak and was mentored by him personally. Bill went on to Porsche factory training and has worked at Rusnak/Pasadena Porsche Service for 30 years.